The Carlile Institute marks its 125th anniversary this year. It has been an iconic part of the Meltham high street since 1891 when it was opened. You can read more about the Carlile ﻿﻿﻿here﻿﻿﻿ and here. The Carlile Institute is now the 'Carlile Community Hub', this year the building has seen a tremendous amount of change - with care, attention and affection poured into the building to bring it back into use for modern purposes. The building works, funded by a Power to Change grant of £238,001, will re-open this September as a re-purposed building for the local community. To celebrate this and it's anniversary, the community have organised a series of events. All the events are free to attend, however due to the restricted numbers for each event, we are requesting a £2 'deposit' on the ticket, which will in turn enter you into a raffle which will be drawn on the final event of the celebrations. You can get your tickets at Cafe 33 and The Flowerbox in Meltham. 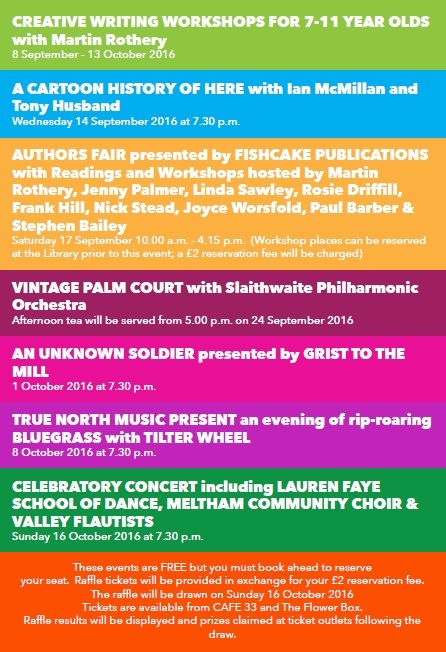 All these events have been jointly funded by Kirklees Council 'Arts in the Neighborhood' fund and Meltham Town Council. I'm sure you'll agree that this is a great line-up and offers exceptional value!